Samsung announced its new Gear S2 smartwatch just ahead of IFA 2015, and we’ve now had a chance to go hands-on with the customizable, circular smartwatch. Featuring a rotating bezel and circular user interface based on Samsung’s Tizen operating system, the Gear S2 is striking to look at and intuitive to use. Read our first impressions in our hands-on Samsung Gear S2 review. 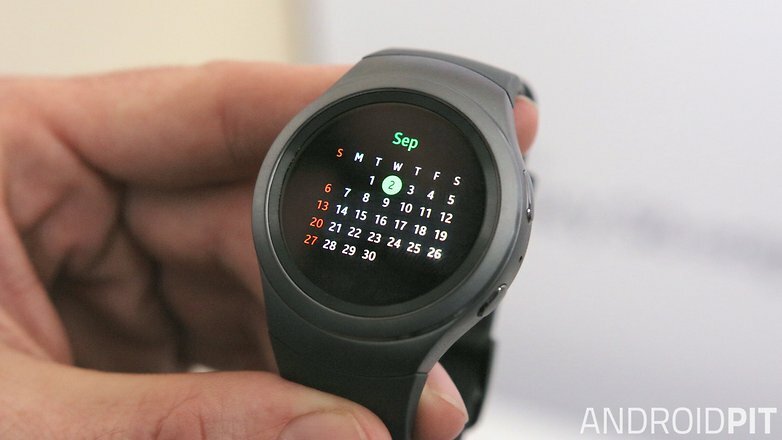 The Samsung Gear S2 release date is set for early October in the US, although no specific date is given. The Samsung Gear S2 price is as yet unknown, but we’ll update this review as soon as we hear anything official. The 3G version of the Gear S2 will be available on Verizon, AT&T and US Cellular, with more carriers possibly to come. The first thing you notice about the Samsung Gear S2 is that Samsung has finally made a smartwatch with a round face, rather than the rectangular face of the original Gear S. This isn’t simply to try out a new shape, because the Gear S2 has a circular interface that works really well with the circular format and rotating bezel. More on that later. On the standard Gear S2, the strap feels like a part of the watch housing, and is thicker where it meets the watch compared to the rest of the strap. It’s flexible, comfortable and closes with a traditional buckle. The Gear S2 Classic has a 20 mm leather strap with a more traditional pin-fastening system and is designed to appeal to those who prefer more classic styling. Both versions of the Gear S2 are made of stainless steel and Gorilla Glass and feature two physical buttons. The top button returns the user to the previous screen, like the back button on your phone, and the bottom button launches the app drawer. Screens can be swiped like any other smartwatch but you can also use the rotating bezel to navigate between screens and menus. It’s an incredibly intuitive technique, and surprising in that no one has done it before. The bezel itself is rather nondescript on the standard Gear S2, although it the bezel on the Gear S2 Classic has small notches around its perimeter for better grip. It’s a small detail that sets these two otherwise identical smartwatches apart. Samsung has really excelled itself with the design of both versions of the Gear S2. Apart from the Huawei Watch, the Gear S2 Classic is the most classically styled and timeless smartwatch design around, and the standard Gear S2 manages to look sporty and futuristic. Whichever you prefer, both Gear S2 options are much better-looking than the original Gear. Both versions are IP68 certified and feature NFC and Wi-Fi, but only the 3G version of the regular Gear S2 has a speaker for making and receiving calls when it is not tethered to a phone. The Gear S2 has a Bluetooth version as well as a 3G version, while the Gear S2 Classic only comes in a Bluetooth version. The 3G version of the Gear S2 makes use of the first-ever e-SIM. The 3G version is 2 mm thicker than the standard Gear S2, which measures 11.4 mm in thickness. The Gear S2 has a fully circular 1.2-inch AMOLED display with 360 x 360 pixel resolution, producing a class-leading 302 pixels per inch pixel density. The pixel density is not that much greater than, say, the Huawei Watch (286 ppi), but nevertheless, the Gear S2 display looks great. Black watch faces look exceptional on an AMOLED display, which is also more battery-friendly than an LCD screen, even if they tend not to be as bright outdoors. Speaking of watch faces, there are 26 pre-loaded options with plenty of customization options. You can even choose a picture from your gallery to create a custom watch face. The screen is surrounded by a very thin on-screen bezel, but it is so thin it’s hardly even noticeable. Moving onto the housing of the watch, the rotating bezel first rises up from the screen, like on a diver’s watch, and then gently slopes down into the housing of the watch, making it seem much less obvious than the bezel on the Huawei Watch. The Huawei Watch may have a better screen-to-body ratio but the Gear S2 has a bezel that also serves as a navigation tool. The Gear S2 software is Samsung’s own Tizen operating system, a fork of Android that Samsung occasionally uses in its wearables. For this device it is a great choice. Navigating Android Wear with a rotating bezel simply would not be possible. Samsung’s circular interface and nifty navigation very impressive. You can swipe between dozens of screens horizontally using your finger or you can twist the bezel to move much more quickly. It’s very intuitive and much faster than clumsily swiping. Where Android Wear uses a vertical setup, Tizen uses a horizontal setup for its home screens and app drawers. Your current screen in relation to the total number of home screens or app pages is marked with a small readout at the top of the screen, so you always know where you are in the OS. It’s very quick to get used to and at no point do you feel like you’re lost in menus. Samsung has done a remarkable job of keeping the interface simple and easy to navigate, despite its complexity. There are more than 1,000 apps available for the Gear S2’s circular format, but many of these are location-specific, so you won’t have access to them all. However, we expect more app developers to get behind this device in the near future. Why? Because you no don’t need to pair the Gear S2 to a Samsung device like you did with the original Gear S.
The Gear S2 will work with any Android device running Android 4.4 KitKat and above, as long as it has 1.5 GB of RAM or more. However, Samsung was quick to point out that the Gear S2 works with standard Google APIs for apps such as the dialer and text messaging, so if third-party apps use non-standard APIs they may not work on the Gear S2. Naturally, Samsung has put a high priority on S Health on the Gear S2, so you’ve got health-oriented watch faces to choose from and a number of software features geared to getting you active. On the hardware side, the Gear S2 has a number of sensors, including a heart-rate monitor. The Gear S2 features 24-hour activity recording, auto-recognition of activity type, ‘inactivity alerts’ for when you’re being lazy, automatic heart-rate tracking which increases in frequency during exercise, and watch faces that change to reflect how active or inactive you’ve been. Other sensors include a barometer, accelerometer, gyroscope and ambient light sensor. The Gear S2 specs include a dual-core 1 GHz CPU with 4 GB of internal storage and 512 MB of RAM. The Gear S2 features an e-SIM which does not require you to be connected to a smartphone to make and receive calls or access the internet. The Gear S2 also features Wi-Fi, Bluetooth 4.1, GPS (on the 3G version only) and NFC. Samsung Pay is supported by both Gear S2 variants for touchless smartwatch payments in stores. However, because of the security features of Samsung Pay, you will only be able to use Samsung Pay with your Gear S2 if it’s paired with a Samsung smartphone with Samsung Pay on it. The Samsung Gear S2 battery is quite small at just 250 mAh, but Samsung claims it will get you through two to three days. We’re very keen to see how true those claims are in our full Samsung gear S2 review, but for now we’ll have to take Samsung’s word for it. One thing we do know right now is that Samsung made a good call on the charging front: the Gear S2 can be charged wirelessly. We’re not sure yet if the Gear S2 is compatible with all wireless charging docks or if you have to use the magnetic dock included in the box, but we’ll update this review as soon as we know. With the Gear S2, Samsung has produced a really compelling alternative to the current crop of Android Wear smartwatches. In many ways the Gear S2 is the most compelling smartwatch we’ve yet seen. Tizen won’t be for everyone and we still don’t know the Gear S2 price, but Samsung has done a very nice job both on design and functionality, with that rotating bezel and intuitive interface. Despite technically being the first of its kind for Samsung, the Gear S2 feels surprisingly accomplished. The ability to make and receive calls, access the internet and receive notifications without a smartphone, either via 3G or Wi-Fi is very tempting. Unlike the original Gear, the Gear S2 has great looks to make that possibility even more enticing, with wireless charging to boot. Could we finally be seeing smartwatches maturing into something people actually want?